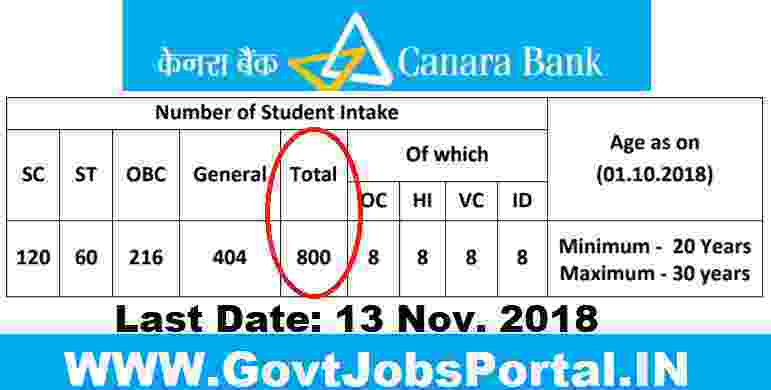 Canara Bank Recruitment for 800 Probationary officers in various branches all over India. Canara Bank is inviting all fresher Indian candidates for this Canara Bank careers opportunity 2018. We hope that you all know that Canara Bank is one of the leading Public Sector Bank in India. The Head Office of Canara Bank is in Bengaluru and have global presence with over 6300 branches. Canara Bank Recruitment Department invites the ON-LINE APPLICATIONS, related to these Canara bank vacancy from all the eligible candidates to apply for admissions to the particularly planned one year training course leading to Post Graduate Diploma in Banking and Finance (PGDBF) either through Manipal Global Education Services Pvt Ltd., Bengaluru or NITTE Education International Pvt Ltd., Greater Noida, which are recognized by UGC. · This course comprises of 9 months of classroom studies and 3 months internship at Canara Bank’s Branches / Offices. · This one year full-time PGDBF course will be conducted either at Manipal Global Education Services Pvt Ltd, Bengaluru campus or NITTE Education International Pvt Ltd. Greater Noida campus. · The programme is fully residential during 9 months classroom studies and the selected candidates should necessarily stay in the campus. Applicants will be carefully chosen for admission to the course at either of the above two institutions through the selection process involving of online objective test followed by Group Discussion and Personal Interview. On successful accomplishment of the course, applicants will be granted with “Post Graduate Diploma in Banking and Finance (PGDBF)” from that organization and the applicants would be presented employment in the Bank as PO (Probationary Officer) in Junior Management Grade Scale-I. More information related to this Canara Bank Recruitment process is given below in this article. So those who are looking to make a bright careers under Canara bank can apply online, but before applying please read the article carefully. Pay Band: Rs. 23,700– 42,020 Per month. Education: Those who are looking to apply this Canara bank careers opportunity must have completed their Graduation in any stream with 60% marks from a well-recognized university of India. Age Bond: Applicants having age in between 20 years to 30 years can apply for this Canara Bank Recruitment process. Age will be calculated on the basis of 1st Oct. 2018. Paying Method: Candidates have to pay the above application fee for applying these Canara Bank vacancy through the following mode: “Debit Card, Credit Card, Net Banking”. No other mode will be accepted for the application fee. Those who are wishing to apply for this Canara Bank Careers opportunity have to apply online through the Canara Bank official website. The link for applying online for this Canara Bank recruitment process will be activated on 23rd Oct. 2018. Candidates can apply online up to 13th Nov. 2018. So those who satisfied all the eligibility conditions which we explained above in this Canara Bank vacancy article can apply online. Check IMPORTANT LINK section for online application as well as for more information. 23RD Oct. 2018 is the Opening Date to Apply. 13th Nov. 2018 is the Last date to Apply.